In an ever-changing world, it is important to remember that we can control our reactions and responses to other people and the situations that arise in life. Accountability Now! shares ways we can all learn to become more resilient in the face of change, find greater happiness, and create an environment where others can learn to do the same. 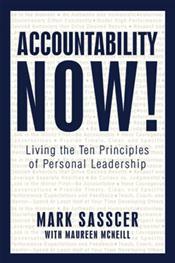 Mark Sasscer, founder and CEO of an international leadership consulting and training firm, relies on ten principles of personal leadership in order to teach others to take ownership for choices, decisions, outcomes, and consequences. While exploring these ten principles that encourage others to be authentic, model high performance, initiate courageous conversations, and mentor others, Sasscer shares not only the stories of over forty leaders who have faced adversity and change, but also details his own personal journey as he coaches others on how to improve their own outcomes in life. With a focus on building healthy relationships where expectations are realistic, Sasscer guides leaders of all types on a path to creating the kind of self-awareness that results in a successful professional career, peace of mind, and ultimately personal contentment.